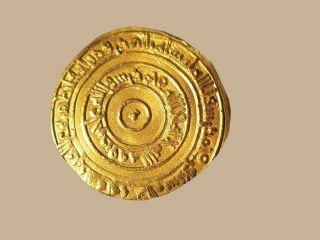 A gold coin (dinar) of the fifth Fatimid Caliph al-Aziz (r. AH 365–86 / AD 975–96), struck at al-Mahdiyya in Tunisia in AH 380 / AD 990. The legend is in kufic script. Centre: raised point within two concentric circles. Second margin: محمد رسول الله أرسله بالهدى ودين الحق ليظهره على الدين كله ولو كره المشركون. First margin: عبد الله ووليه نزار الإمام العزيز بالله أمير المؤمنين. Second margin: بسم الله ضرب هذا الدينار بالمهدية سنة ثمانون وثلثماية. 'In the name of God, this dinar was struck at al-Mahdiyya in the year 380.' (AD 990). 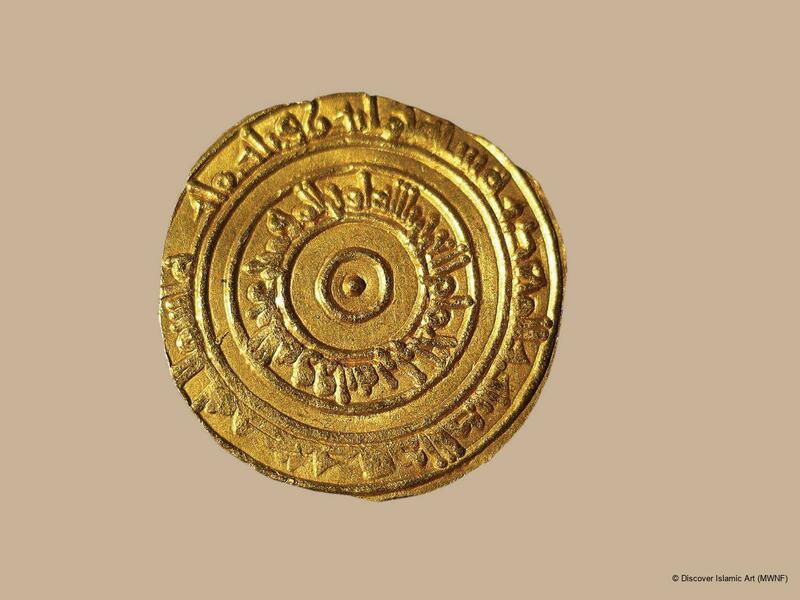 A gold coin (dinar) from Ayla in Aqaba. 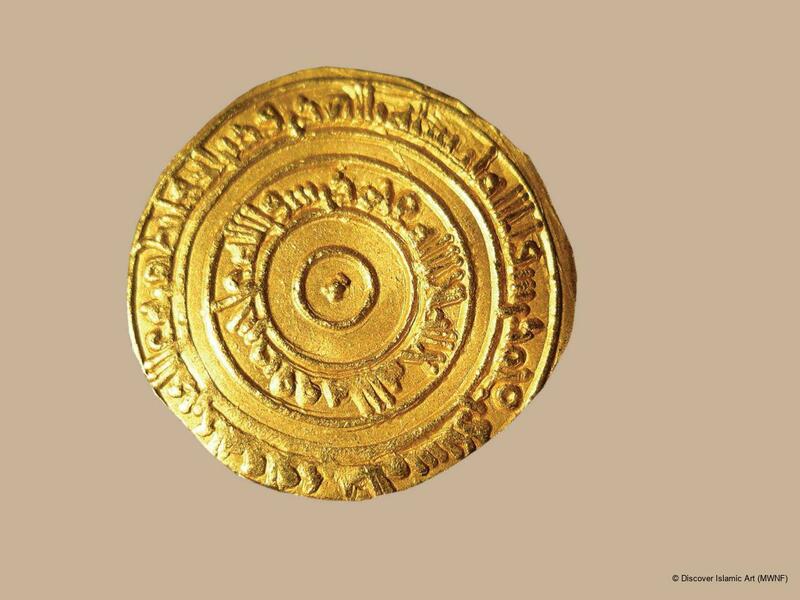 On the reverse is the name of the fifth Fatimid Caliph al-Aziz (r. AH 365–86 / AD 975–96), the place of minting, al-Mahdiyya in Tunisia, and the date 380 / 990. Ali is mentioned in addition to the Prophet Muhammad on the obverse. The legend is in kufic script. The coin is dated and the place of mint recorded: 'In the name of God, this dinar was struck at al-Mahdiyya in Tunisia in the year 380.' (AD 990). 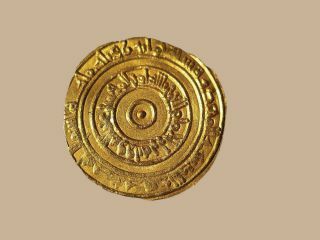 The coin was acquired by the Museum as a result of an archaeological excavation carried out at the site of historic Ayla (Aqaba) in 1993–4. The place of mint is inscribed on the coin as al-Mahdiyya. Pool, R. S., The Coinage of Egypt: (AH 358–922) under the Fatimee Caliphs, the Ayyobees and the Mamlook Sultan, Classes XIV.XV.XVI, London, 1879, p.17 (year AH 384). العجابي. حامد، "جامع المسكوكات العربية بإفريقية", تونس،1988، ص 228، قطعة رقم 296، اللوحه 28. داود. مايسه، "المسكوكات الفاطمية بمجموعة متحف الفن الإسلامي بالقاهرة"، دار الفكر العربي، القاهرة، ص 53-55.